Changes to glove standards have been few and far between since 2003, but changes to protective glove standards are now a necessity. In this article, Dr Jean-Claude Cannot looks at the proposed changes to glove standards due to be implemented in the coming year. Since 2010, Personal Protective Equipment (PPE) European notified bodies have been collaborating in the preparation of future changes to be made to European PPE glove standards. Times have changed and subsequently the current standards have now reached their limits when it comes to certain safety issues in the workplace, not to mention their outdated testing procedures. Change has not come without difficulties. Behind any change in a standard there is always a set of parameters initiating the change. In this case, the notified bodies have had their work cut out in pinpointing the parameters that have created discrepancies with the current standard testing procedures. 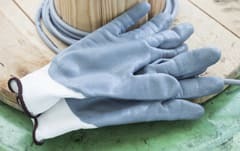 There are essentially two standards due to be modified in the coming year: EN 388 protective gloves against mechanical risks, and EN 374 protective gloves against chemicals and microorganisms. This standard applies to all kinds of protective gloves in respect of physical and mechanical aggressions caused by abrasion, blade cut, puncture and tearing. These provide protection against mechanical hazards expressed by a pictogram, followed by four numbers, or performance levels, each representing a test performance against a specific hazard. This standard specifies the capability of gloves to protect the user against chemicals and/or microorganisms, either through penetration or permeation. Penetration is the movement of a chemical and/or microorganism through porous materials, seams, pinholes or other imperfections in a protective glove material at a non-molecular level. Permeation refers to the rubber and polymer films in gloves that do not always act as barriers to liquids. Sometimes they can act as sponges, soaking up the liquids and holding them against the skin. It is therefore necessary to measure breakthrough times, or the time taken for the hazardous liquid to come into contact with the skin. The EN 388 mechanical risks standard is one of the most commonly used standards when testing safety gloves. It currently involves four testing procedures: tearing, perforation, abrasion and cutting. In terms of the testing procedures related to tearing and perforation, the notified bodies have not detected any inconsistencies with the current testing procedure. The testing procedures for tearing and perforation will remain identical to the current procedures laid out in the official European EN 388 standard. When it comes to abrasion and cutting testing procedures, fairly substantial changes will be undertaken. The changes in question relate to a number of consumable products manipulated during the tests. The consumables in question include sandpaper, circular cutting blades and textiles. For the abrasion resistance testing procedure, a type of sandpaper is used. For the cut resistance testing procedure, a circular cutter blade and textiles are used. These consumables have proven unstable overtime, creating inconsistencies in the performance levels of safety gloves. If we take the example of the circular cutter blade used for the cut resistance test, notified body members have observed an increase in the level of sharpness of knives and blades available on the market place. This ultimately means their cutting ability is increasing. They have also seen an increase in the level of resistance of materials used in the manufacturing of safety gloves. As a consequence, the performance levels of safety gloves when tested have been lowering overtime, making it more difficult to satisfy the requirements with the current consumables. In the case of the sandpaper used during the abrasion testing procedure, the sandpaper used up until now no longer exists. This has meant allocating time to source a new one. These findings have led to an improvement in testing methods by addressing the evolution of functional characteristics to consumable products used in the testing procedure. Calibration procedures have been put into place to assess conformity to new consumable product specifications. In general, changes to safety glove standards include calibration processes to the consumable products employed in the testing procedure. Inter-laboratory testing has been implemented to double check the pertinence of the calibration procedures. The implementation of the new calibration processes has, by and large, been gradual and complicated. Acquiring a new type of sandpaper has proven time consuming, although one was eventually sourced in Germany. The new sandpaper then had to be certified with the EU testing requirements. Major changes to the EN 374 chemical and microorganism hazards standard have come about due to the European Commission’s request to create a fusion between chemical permeation evaluation methods applied to shoes, clothes and gloves, in order to have one simplified testing procedure. This testing procedure (the former EN374-3 will become EN 16523-1) then had to be developed and put into place. It is currently at the formal vote stage within the European Commission. Once the standard has reached the final stages in its development and the vote is taken, the testing procedures relating to the general requirements will then be modified. At the time of going to print, initial recommendations of changes to general requirements were under public enquiry. Until now, the glove resistance standard EN374 part 1 constrained gloves to be tested according to three different chemical products with very distinct conditions. The new standard will first of all make available to manufacturers and companies a prelisted number of chemicals to be tested. Secondly, the new standard will provide more flexibility to manufacturers and companies, allowing them to test either one, three or six chemical substances. The standard will become more complete and thorough by introducing the notion of deterioration testing of safety gloves into the current standard. Dimethylformamide is used as an industrial solvent and in the production of fibres, films and surface coatings. In the case of safety gloves, those made from polyurethane (PU) are the main concern. Current restrictions in Germany are making it difficult for manufacturers to sell their products there, as the legislation enforced in Germany is not in line with the rest of Europe. The European Committee has decided to take things into its own hands by developing a new testing procedure to gain homogeneity across all European nations. This singular method of evaluation for the whole of Europe comes in the form of the new EU standard, EN 16778, which is designed to detect the presence of Dimethylformamide in safety gloves. This is an important standard in the sense that a high level of acknowledgement across Europe needs to be attained to be able to enforce the standard, which for the moment is still undefined. This new standard in glove innocuousness will mean revision of the general standard for safety gloves the EN 420, outlining the general requirements. As technology has advanced, mechanical and chemical risks have continued to progress, while the standards for protection have remained static. With EN 374 and EN 388 now hazardously out dated, revision and modification of the standards cannot come quickly enough.